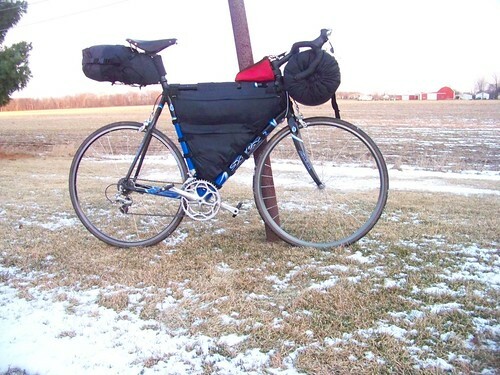 The possibilities of ultralight touring are affecting me in strange ways since I finished putting together my new frame bag system. I can only describe it as an itch that I haven't been able to scratch due a nasty cold made all that much worse by the fact that it's snowing heavily out today and I soooo love to ride in the snow. In fact there's a little voice in my head saying, "to hell with it you're almost over it anyway, it's time to go out and play!" I shall not be able to resist this voice much longer and I suspect I will find myself on deserted back roads riding my Surly Cross Check in gently falling snow by the moonlight (or LED) sometime this evening. Is it so wrong that I was watching this video by Bret Taylor composited from photos taken every five minutes of his entire TransAm ride (via Bike Bits) and all I can think is "look at how beautiful those roads are... you could definitely ride that entire route with some 25mm skinnies, a composite frame and ten pounds of base gear". A million thanks to Bret. I can think of absolutely no better or faster way to get a complete overview of the road conditions along the entire TransAm route then Bret's video. Scratch that... without Brett's video there's absolutely no other way to get a sense of road conditions. Other then Bret's video there's only instinctual "map sense" based off of years of reading maps, planning and riding routes in different areas of the country and perhaps google maps. I can't imagine how long it'd take to overview the entire route in Google's "street view", even if the entire route were entirely covered by street view. Google Earth is cool for a terrain overview but not road conditions. The only thing that can give you a sense of road conditions is to see the actual road. 4000 miles of road condensed to just over six minutes and set to some good music. Good stuff. Ankle sprain read your article, There's no doubt that that is very well! Simple language, concise blog! Another form of style! I'm keen! This looks so cute! Might are interested in this. I miss Alexis Bldel, I thought i was a popular GG fan and loved her on the Sisterhood movies too. Hopefully she'll still act in more movies an excellent one.